This is all that's left from the delicious carrot cake I made. I found the recipe on Pinterest. I love Pinterest. This cake takes a little prep work but the end result is moist and delicious. For all of your kids out there that don't like veggies; they won't even know this cake is packed with carrots. And the cream cheese frosting...well, it completes me. Make it today. I promise you will love it. 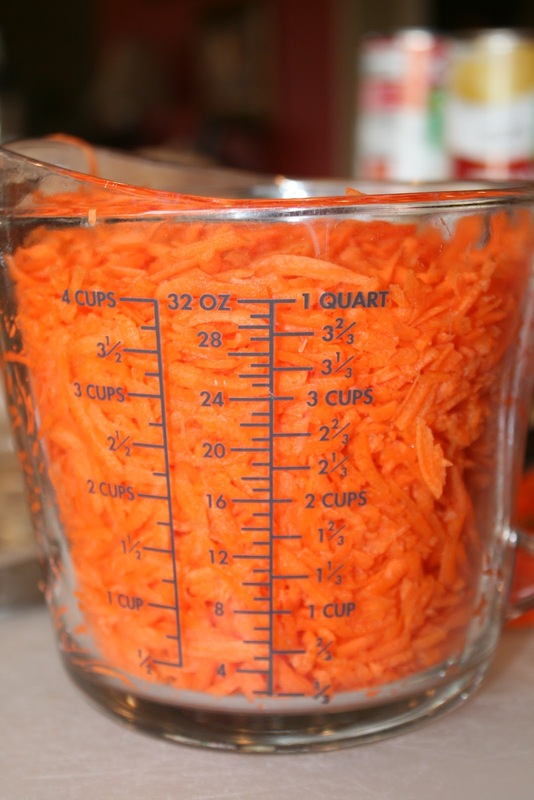 You'll need around 2 pounds of carrots (or 1.996 pounds) peeled with ends cut off. I shred mine in my Cuisenart. You can also shred them with a hand grater. When all is said and done, you need about 4 cups of carrots. Put eggs and vanilla ingredients in a bowl. Mix until incorporated. Set aside. Pour oil and sugar in mixing bowl. Mix well. Add dry ingredients and then egg mixture. Batter will be stiff. Add carrots and combine completely. There we go; looks perfect. Pour into a greased 13x9 inch pan. Bake until your house smells delicious and the cake is golden brown. Now mix up some cream cheese frosting. Doesn't that look di-vine? I spread the frosting on the whole cake and nuts on half. My kids don't like nuts. This is all I had left of this delicious cake. We took it to neighbors and friends. So Delish. Whisk together the flour, cinnamon, powder, soda, and salt. In a separate bowl, beat the eggs with the vanilla. Set both aside. In a large bowl, beat together the oil and sugar in a mixer or by hand until they reach a uniform consistency. With the mixer on low, beat 1/3 of the flour. Next, add 1/3 of the eggs. Continue adding the flour and eggs in alternating additions. Stop mixing when the last of the flour is just barely incorporated. Fold the carrots into the batter with a spatula, working slowly and gently until the carrots are distributed and no more dry flour remains. Pour the batter into the baking dish and tap the dish a few times against the counter to work out the air bubbles. Bake for 45-50 minutes, rotating once during baking. The finished cake should be slightly puffed in the middle and browned on the edges. A toothpick inserted in the middle should come out clean. Let the cake cool completely before frosting, about one hour, or wait to frost until the next day. Leftover cake can be kept, covered, at room temperature for several days. You can also wrap the unfrosted cake in aluminum foil and freeze it for up to 3 months. Beat together the butter and cream cheese. Slowly beat in the vanilla, confectioner's sugar, and salt. Increase to high speed once the frosting starts to come together into lumps. Beat until creamy, scraping down the sides of the bowl as necessary. 0 Response to "Carrot Sheet Cake with Cream Cheese Frosting"